The Mount Saint Mary Knights were defeated by the Farmingdale State College Rams 68-67 during their Skyline Conference game on Saturday, February 17, 2012 in the Kaplan Center in Newburgh, NY. Mount Saint Mary Knight Carlos Valdez (13) and Farmingdale State College's AJ MAtthews (5) leap for the opening tip off during their Skyline Conference game on Saturday, February 17, 2012 in the Kaplan Center in Newburgh, NY. 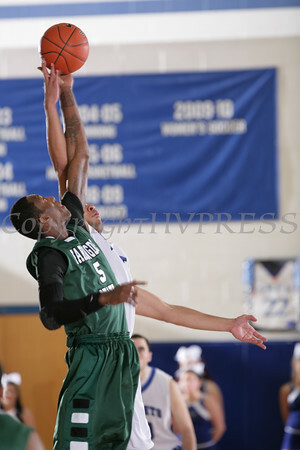 Farmingdale State College defeated MSMC 68-67. Hudson Valley Press/CHUCK STEWART, JR.